You might hear merchandising job profile. In garment manufacturing merchandisers play very important role. You might also hear the term ‘Sampling Merchandiser’ and ‘Production Merchandiser’. Do you know the differences between these two job profiles are? Though there are no fixed rules for job responsibilities of these two job profiles. We can draw difference between a sampling merchant and a production merchant based on day to day activities performed by them. Normally small size garment manufacturing companies don't employ different merchandisers for such different roles for sampling and production activities. All activities are looked after by the same merchant. So they are not given such name as sampling merchant or production merchant. In medium and large size garment manufacturing companies, different teams are found for sampling activities and production related activities. Even some companies have separate set-up or office for sampling. In case there are merchandisers in two different profiles in a company following are the difference activities. 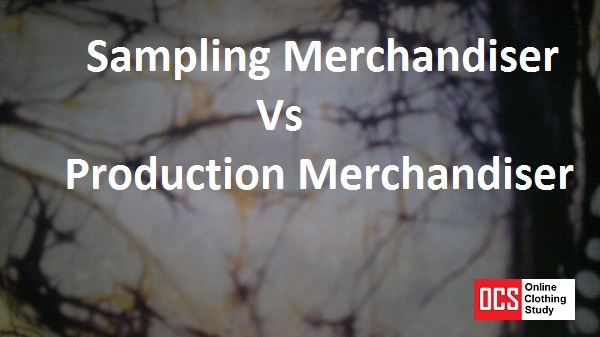 Read following activities to understand difference between sampling merchandiser and production merchandiser. Sampling merchandisers are responsible for sampling activities, which includes followings. Coordination with buyer related to sampling requirement - they communicate with buyers for sampling process. Product development – fabric development and sample development is handled by them. Handing sampling team – Many cases it is found that merchandisers handle sampling team. Preparation of sampling order for the sampling tailors – merchandised receive style techpack from the buyers and explain style requirement and style detailing to sampling master (sampling in-charge) and pattern master. Also they explain buyer's comments on samples to sampling head and tailors. Activities of production merchant starts after receiving of purchase orders (PO). Production merchandisers take handover of style file from sampling merchandiser. They prepare schedule for production activities. Follow up with production team and with factories if factory has multiple production units. There responsibility ends after shipment is dispatched to buyer. Activities of a production merchandiser have been explained in an earlier post. Please read this article to know the difference between these merchandisers. What is difference in job responsibilities between a sampling merchandiser and production merchandiser.